This weekend has been all about getting stuff off. This weekend I am not sure what has come over me, I don’t know if it was the sunshine for most of the week and now it’s the weekend that got me in this mood. I think I have taken more bits of the car now than when I got it! The front valance is off (click here), the radiator valance is off, the hood catch is off (click here), the front drums are off again (click here) and then I started on the inside. What am I on about this weekend? I decided that the next job is going to be the wiper motor replacement, the fact the wipers are stuck half way across the screen annoys me and the fact I have not tidied up the wires since I re-wired her annoys me. The reason I have not tidied the wiring as I knew the wiper motor had to come out sooner rather than later, this weekend was that time. My research tells me it was going to be a difficult job so I put it off for as long as possible . At the Enfield Pageant I purchased some stubby spanners with this job very much in mind as well. Armed with my selection of spanners, screw drivers, pliers, various assorted ratchets & sockets, WD40, torches and just about anything for four bolts or three if I was lucky! The wiper motor is held to a bracket by three insulated bolts to a bracket. The bracket is held in place by four bolts. Two bolts at the top behind the dash and two at the bottom right up under where the brake pedal is located. Plan A: Wiper motor off, job done. Plan B: Bracket off not ideal but it won’t come to that. So I sat down crossed legged on the floor pan and started to investigate. 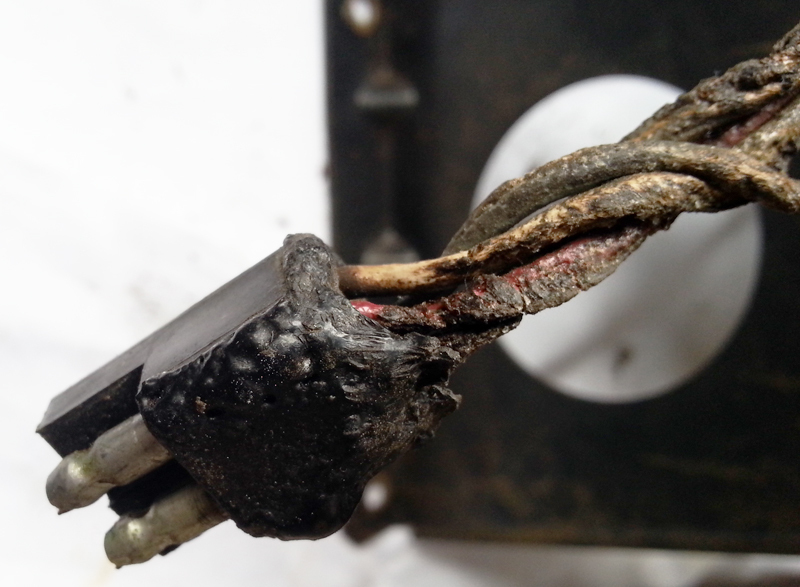 It was dark – torch (Snap On magnetic) sorted. It was very tight in there and I couldn’t see where I needed to go, extending mirror – sorted. 7/16ths stubby spanner to the inside of the bracket – nope! The arm of the back of the motor was sitting right on top of the nut I was trying to get too. Plan B was lookin’ ominous for implementation. Idea, Plan A/2, remove the arm then I could get to the bolts, I went to remove the nut on top, job done. Just had to lift up the arm of the motor spindle and I was in there. Nope, it weren’t gonna move. Poxy Plan B it was going to have to be. Remember what they said on YouTube – clips at the bottom and clips at the top. They will be a pain but can be done. There it was clip at the bottom, screwdriver in second attempt to open the clip success. I smiled. Then the top wiper arm pivot clip. What clip, there is no clip. So I cleaned the top up of grease and grime and repositioned the mirror. Moving the fingers to the top I felt it and my heart sank. A C-clip was on the top. It was turning quite freely and laughing in my face of concentration and patience. I tried long nose pliers and circlips pliers. No way, so I had to resort to improvised Plan B/2. This involved a weird contortion of the left arm and a small screw driver to lift the clip up on one side. But I had to have my other hand through the radio hole to hold the clip still from spinning. So there I was hands in the dash head trying to look through a letterbox of a dash-board and a steering column jammed just under the collar-bone. Eventually after an unknown amount of efforts one side lifted up and then it pinged up into my hand. Ha, who’s laughin’ now then clip? There is no way that little swine that still has my flaring tool part is gonna have this bit as well. OK, so I bent it a bit but it was off, I straightened it with pliers and it is fine again. The wiper arms came of no problem after that, they were able to be moved quite freely once they were disconnected. Now the four bolts for the bracket top two were simple and the bottom two were a bit of a pain. To cut a long story short I have posted a guide on the process here, or go to the Photos – Inside Car – Wiper Motor 2 Speed Project. Once I eventually got the bracket out it was time to take it back to the man cave, I uncrossed my legs and then it hit me, cramp in my leg. I couldn’t stand up or get out the car, I had to spin round on my back an straighten the leg up towards the rear window with my head under the dash next to the brake pedal. The pain subsided and it was time to get out of the car. I was crossed legged for almost two hours according to my clock on the wall. I knew my legs were getting a bit numb but my concentration had taken my mind of it all. The parts were taken back for photographing for the steps. Sunday I managed to get out the power assisted steering pump as well as this has a leak from the seal at the front of the pump, I will need a new one of these too. I have also got a set of photos for steering pump removal here, or go to the Photos – Engine Bay – Power Steering pump. So If your reading this Adam, I think you know what I need, a two-speed wiper motor, wiper under dash loom and a power steering pump for an Air Con fitting car. 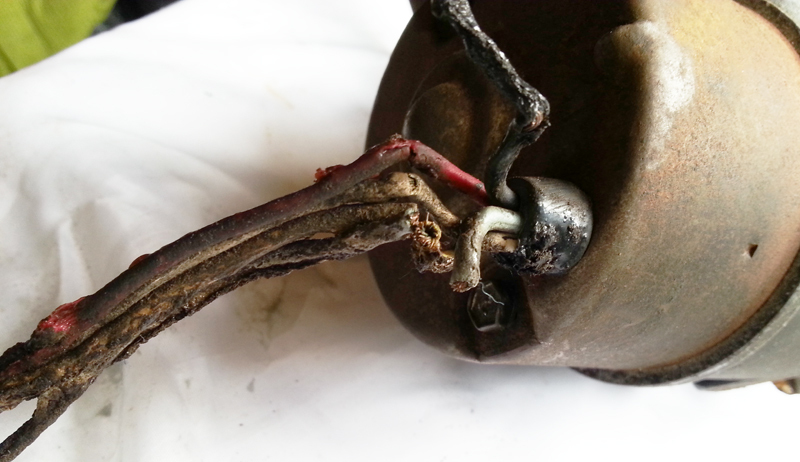 The wiper motor was worse than I expected, here is a couple of pictures of the damage to the wiper motor, other parts of the wiring loom were like this as well and can be seen in the original wiring pictures. They don’t tell you in workshop manual give yourself a break to avoid getting cramp! The do’s and don’ts of wiper motor removal. Do take a break, and don’t sit there too long with your legs crossed. Will I get the clip back on? I hope so and to be honest a bit worried about it, this time I will not sit crossed legged for too long, but I will keep my fingers crossed! This entry was posted in Articles, Car, General, Photo's and tagged 2 speed, air con, classic car, cramp, dashboard, fender, learning curve, Mustang Maniac, plan a, plan b, power steering pump, restoration, Snap-On, spanners, torch, uk registration plates., under dash loom, wiper motor, wire loom. Bookmark the permalink. Thanks for liking one of my posts, and leading me to your blog. This is great! I’m a Mustang fan, and also have a ’66, a burgundy convertible. If you’re not already, you might consider joining the Mustang Club of America; they helped me track down a few parts for my car. I have been thinking about joining a Mustang owners club of some sort but im not sure which one. Parts can be a pain but I have a friendly supplier who keeps me busy. Pleasure to share a passion of Mustangs with you. Sometimes things simply don’t go as expected. Thanks for the comment. The one thing I have learnt from doing this car up is that some of the simplest job take longer than the more complex jobs. The fact I eventually git it apart does give you a sense of satisfaction at the end of it. Still reading, but fantastic so far.